A crazy snow-rain storm catched me with power at this location but I didn't seek shelter in the plane, because I had the hope that there would be a special moment with the falling rain and the heavy clouds. 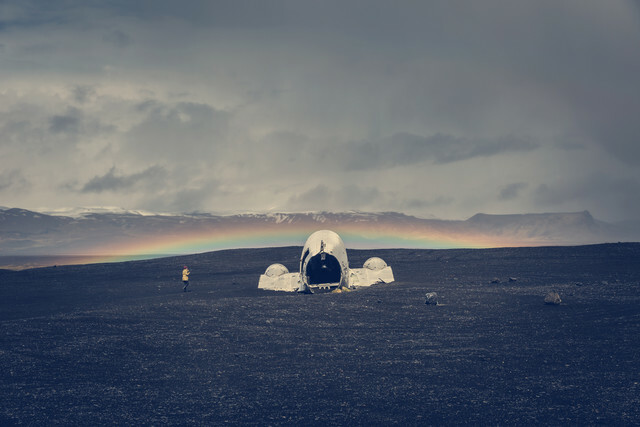 It was great luck that a rainbow appears over the aeroplane an one person walk along. That the special moments for a photographer to get a unique picture. This picture is part of the series LOST IN LANDSCAPE - you can see the picture live at ISPO MUNICH 2018, hall B3, booth 206.